Farmersgirl Kitchen: The Pudding Challenge! I do like a challenge, so when I saw this challenge on the UK Food Bloggers Association, I jumped at the chance to create something different with this delicious pudding. I love Christmas Pudding served in the traditional manner so, of course, I had to have a taste before deciding how to use this pudding to create a dish that was worthy of this delicious pud. 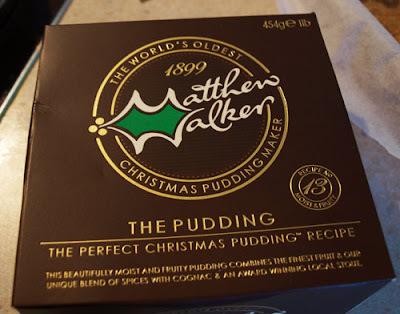 The kind people at Matthew Walker provided me with a couple of free puddings, why not visit their site to find out more about 'The Pudding'. To spice up Christmas, we’re urging all UKFBA food bloggers to use ‘The Pudding’ and create some cracking alternative Christmas fare to get ours, and your readers’, taste buds tingling! The blogger who conjures up the most creative cuisine will win a top of the range camera along with a one-to-one session with a respected home economist, to help make those foodie photos. Melt the butter in a frying pan , add the chopped onion and celery and cook until soft. 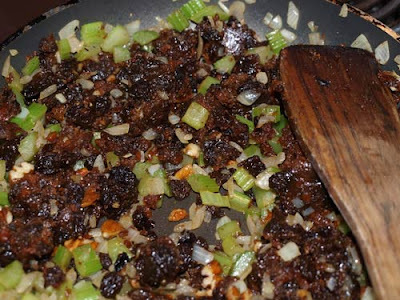 Crumble 'The Pudding' into the pan and mix with the onion and celery, add the chopped nuts and season with salt and pepper. Leave to cool, then add the egg yolk to bind the stuffing together. Stuff the bone cavity of the lamb with 'The Pudding' mixture and tie up with string or secure with cocktail sticks. 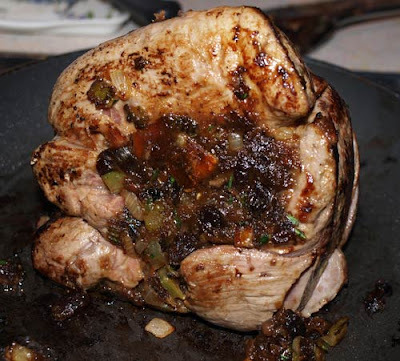 If there is any stuffing left over it can be cooked separately in an ovenproof dish. Heat the oil in a roasting tin and brown the lamb on all sides. Add the shallots to the tin. 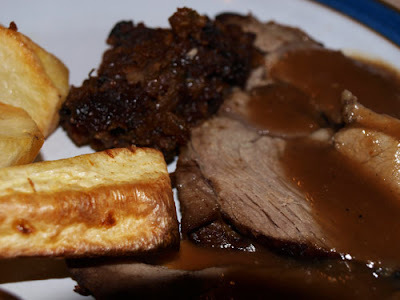 Roast at 180C (375F) for about 1 1/2 hours for pink lamb, 1 3/4 hours for well-done meat. Transfer the lamb to a warm platter, cover with foil and leave to rest in a warm place. Put the shallots, lamb stock and any juices from the lamb in a small pan and puree with a hand blender, add the redcurrant jelly and warm through. Carve the lamb with 'The Puddding' stuffing with roasted vegetables and the shallot & redcurrant jelly gravy. Beat the cream cheese with the flour, sugar, eggs , the yolk and the creme fraiche or soured cream until light and fluffy. Crumble 'The Pudding' and distribute it evenly across the biscuit crumb base. Pour the cream mixture over the base and 'The Pudding'. Bake for about 30 minutes and then check, it should be set but slightly wobbly inthe centre. Leave in the tin to cool. 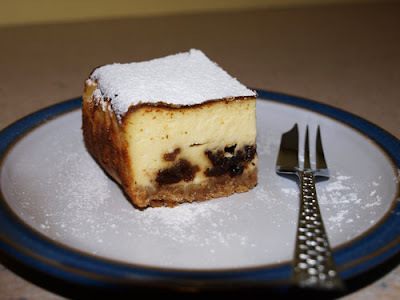 Remove from the tin, as my tin was square, I served the cheesecake in rectangles, dusting the top with icing sugar. 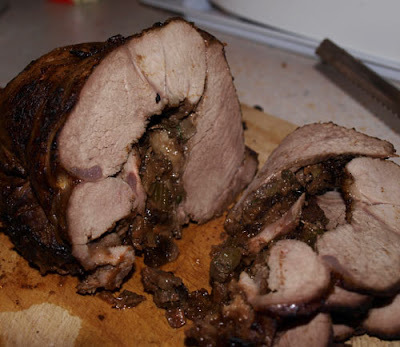 The expert tasting panel, my husband and my mother-in-law, really enjoyed both of these dishes, but the "Roast Shoulder of Lamb with Matthew Walker 'The Pudding' Stuffing" was definitely voted the top recipe. Great ideas Janice. Love the sound of the stuffing but you can't beat a good cheesecake either. Yum! Great challenge, best of luck! What clever ideas you have. I looked at the challenge and didn't have a single creative thought. I am really impressed - you have been extremely innovative.